Barnes & Noble is the largest book retailer in the United States. 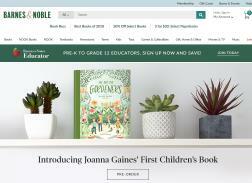 Recently, with the Barnes & Noble Nook and Nook Color the company has expanded to offer downloadable e-books as well. Enjoy a cup of coffee from one of their in-house cafes while browsing the aisles of music, magazines, fiction and non-fiction books. Barnes & Noble: No coupon code needed. Tap to shop the sale now. Barnes & Noble: Tap offer to copy the coupon code. Remember to paste code when you check out. Online only. Barnes & Noble: Get 50% – 75% Off Holiday Collection. Barnes & Noble: Get 3 for $30 select Paperbacks. Offer ends on 01/28/2019 at 2:59 am ET. Barnes & Noble: Get Up to 80% Off New, Used and Rental Textbooks + Free Shipping! Barnes & Noble: Buy 1, Get 1, 50% Off Jigsaw Puzzles. Online Offer is valid through 02/01/2019 at 2.59 AM EST & In-Store offer is valid through 01/31/2019. Barnes & Noble: Get 50% Off Clearance Sale. Sale includes Gift, Home, Office, Calendars, Toys, Kids Books, Books, Games, Collectibles and more.